The time machine has been parked in Mr Hedderly’s back yard (we have a special arrangement with him –we’re promoting his work in the 21st century). We’re here for another three weeks. Put down that instalment of the Old Curiosity Shop, we might as well go out. This is the first era of mass entertainment after all. Music halls, panoramas, dioramas, exhibitions, zoos and menageries, gambling, any amount of sport to watch or play. Or we could go to a place where there is music, dancing, fireworks, performing animals, balloons, plays, ballets, magic, freaks, prostitutes and above all stunts – death defying feats. 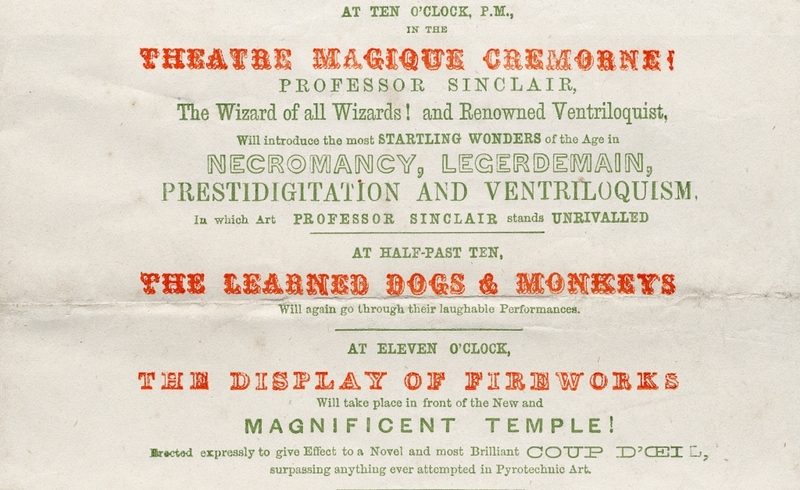 That’s Cremorne Gardens – not quite the greatest show on earth…but close enough. Her? If you’re lucky I might get Mr Rossetti to introduce you to her later. In the meantime check out the show bill. In the afternoons it’s all harmless stuff. Educational even. It’s that sea bear (or walking fish) I want to see. Arctocephalus Ursinus no less. You or I might be slightly let down to see the fish / bear in the flesh. Later in the evening the real fun starts. I can’t help feeling that actual necromancy might be asking a little much even from the renowned professor, but I would be prepared to be convinced. I could do without the dogs and monkeys but the fireworks could be good. Mr Whistler the American artist is said to like them. His sometime friend Walter Greaves painted him at Cremorne, but that’s a story for another day. I’m waiting for the next event. This should be worth seeing. Some of the ladies and gentlemen are standing a little closer than modern health and safety regulations and maybe common sense would allow I think. 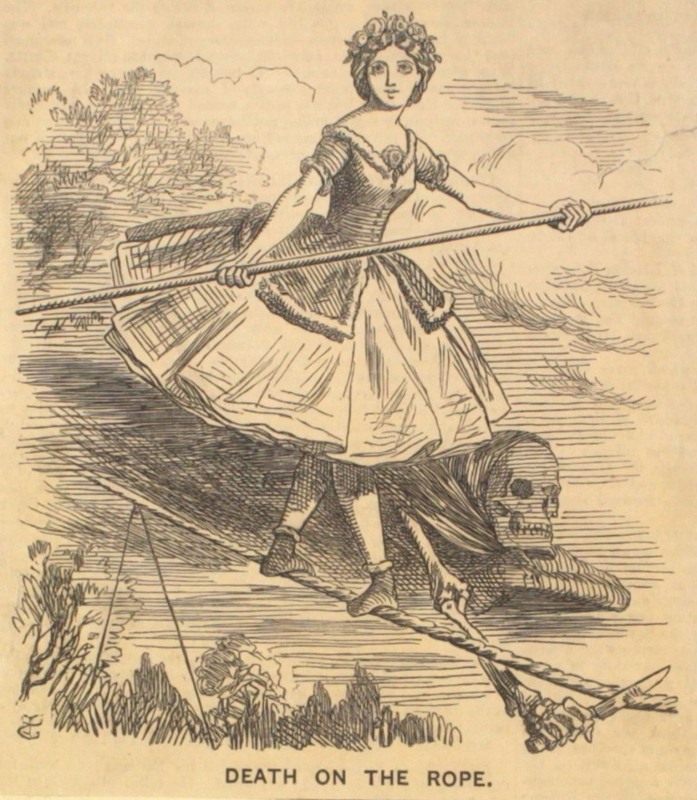 (Ladies, remember those scare stories in the equivalent of Daily Mail about crinoline fires?) This is basically a man in protective clothing I suppose so it’s just a case of good equipment and strong nerves,but I wouldn’t want to try it. As it turned out Coro was in more danger from a disgruntled former partner (Francisco Filliponi, the Emperor of Fire) who later tried to kill him with poisoned strawberries. If we’d come on another afternoon we might have seen strong nerves and a high degree of skill. She was a tightrope walker who went by the name of the Female Blondin. 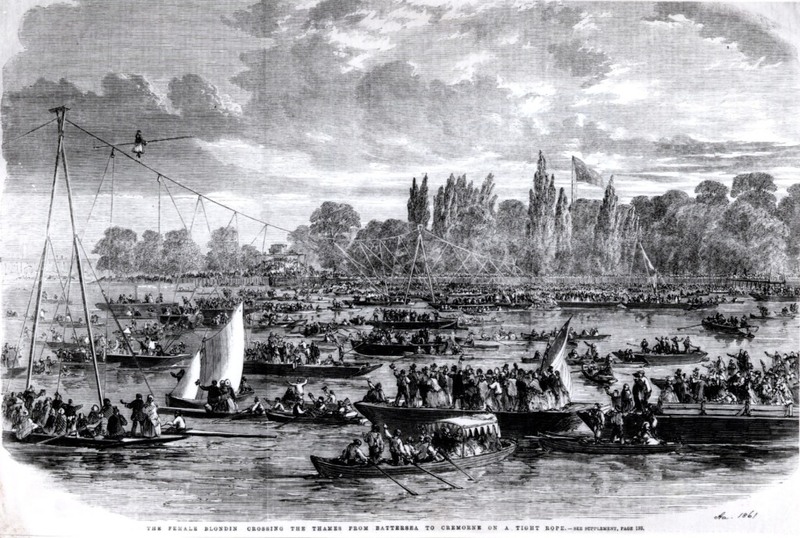 A few years before our visit in August 1861 she attempted to cross the river from Battersea to Cremorne. I don’t think Death literally accompanied her but it was a close run thing. The rope seems to have become a little slack over the final third of the course. She stopped and was forced to climb down the guide ropes to be rescued by one of the boats. The engraving makes it look as though the river was thick with boats but there would still have been plenty of open water. Onlookers reported that the daring young woman wept tears of frustration when she was forced to climb down, cutting her hands in the process. She was vindicated later in the month when she successfully crossed both ways. Now that’s entertainment. Our final act today moves from calculated risk to an idiotic disregard for safety, and brings us back to balloons, a Cremorne favourite. 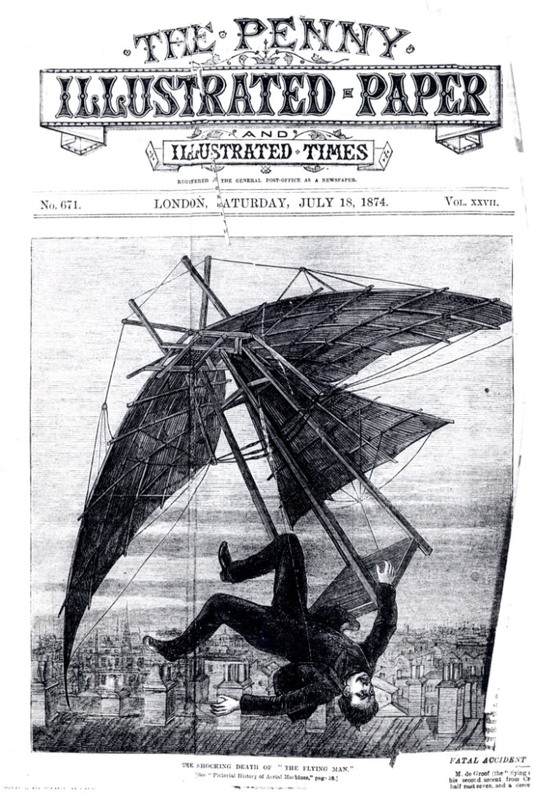 Jumping from a balloon with an improvised parachute can be done as was demonstrated at Cremorne by a Mr Hampton as early as 1839. 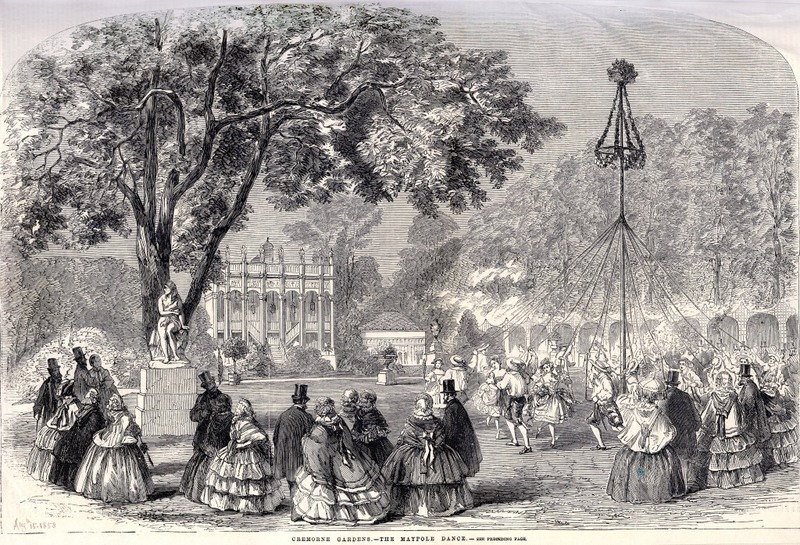 But in 1874 in the final decade of the Gardens a Dutchman named Willem de Groof attempted a far trickier feat, jumping from a balloon wearing a set of homemade wings attached to a kind of wooden platform, intending to glide safely to earth. You wouldn’t really have wanted to see the result. De Groof fell to earth in Sydney Street near St Luke’s Church (see last week’s post). He died a few days later. 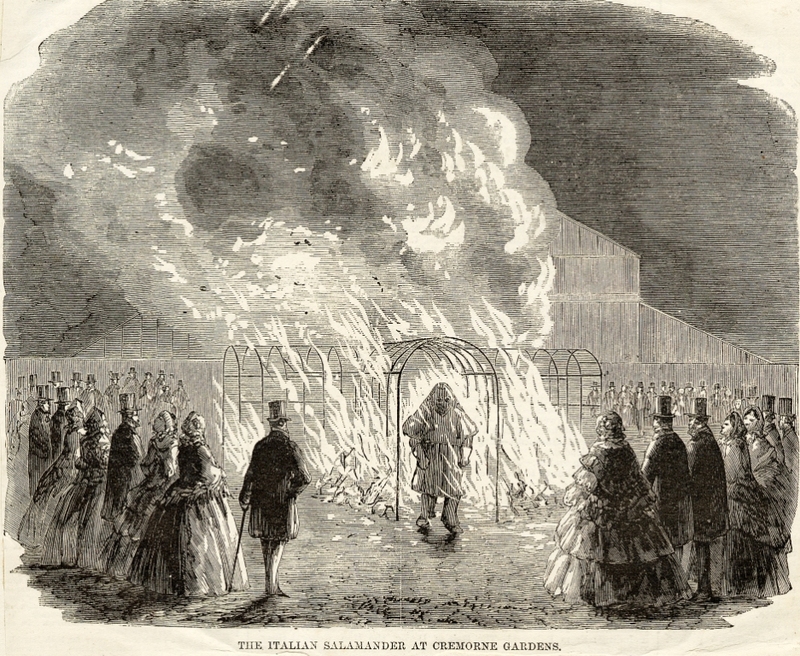 The proprietor of Cremorne at the time, John Baum was probably grateful the tragedy occurred outside his grounds as he already had financial troubles along with respectable citizens trying to shut down the Gardens on the grounds of immorality. 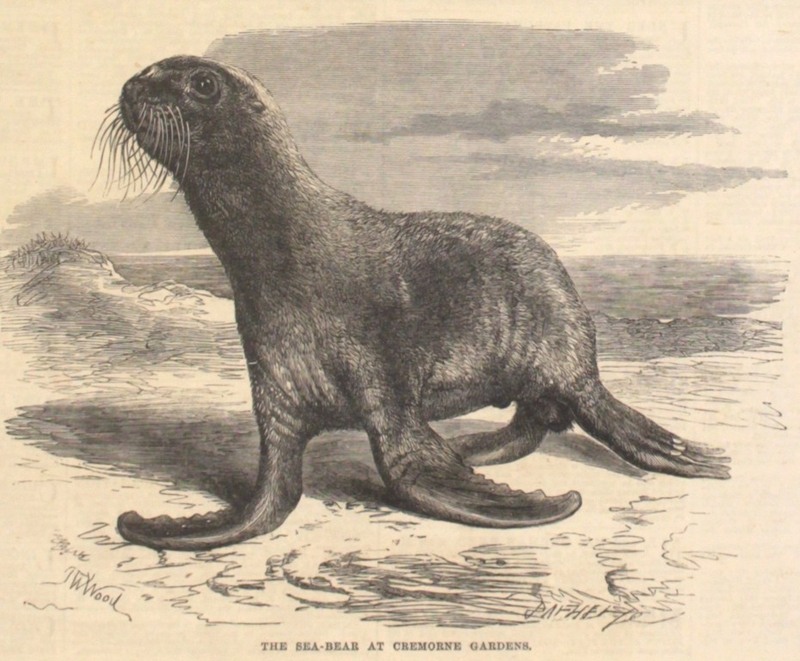 De Groof was the subject of many stories like the one above and even a narrative poem. So we end with a salutary tale. Now what about that immorality? Back to the night of our visit, Derby Day 1865. On the show bill it says “dancing will continue till the close of the Gardens”. Dancing and whatever else went on in the grottos and the shadowy corners of the gardens. Let’s leave them to it and get back to the Time Machine. Unless you fancy one last dance? I’m sure that readers of this blog are not quite as interested in the number of page views as I am but nevertheless I want to tell you that this week we passed 20,000 page views since the beginning of the blog. And 21,000, and 22,000 and 23,000. In fact it was a busy couple of days, thanks to a post on Metafilter, some tweeting and some Facebook activity. 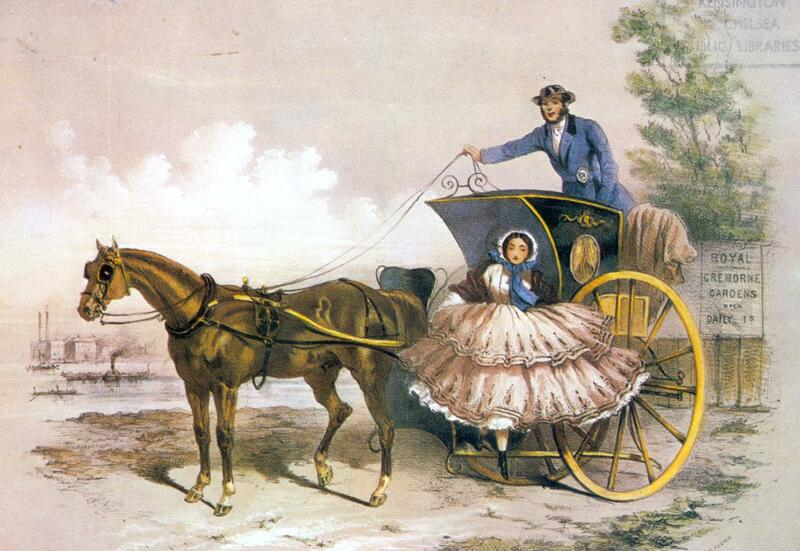 So thanks to everyone who passed the link to the Linley Sambourne post on in any way. Sometimes I follow my own obsessions when I’m selecting pictures and writing posts, but I also take note of what readers seem to like. So if you want more Linley Sambourne, more Hedderly, more Cremorne, more empty streets and more picture of 1970s Kensington and Chelsea let me know. This entry was posted on Thursday, April 12th, 2012 at 12:28 am	and tagged with Chelsea, Cremorne Gardens, Victorian entertainment and posted in 19th Century, Chelsea, Cremorne Gardens. You can follow any responses to this entry through the RSS 2.0 feed. Mr.Walker…You really have outdone yourself with this one. Cremorne Gardens with never quite seem the same…your post has altered space…perhaps you are really a secret sculptor. Thank you, Mr Walker, this is an excellent piece of research. Might I ask what archives you use? 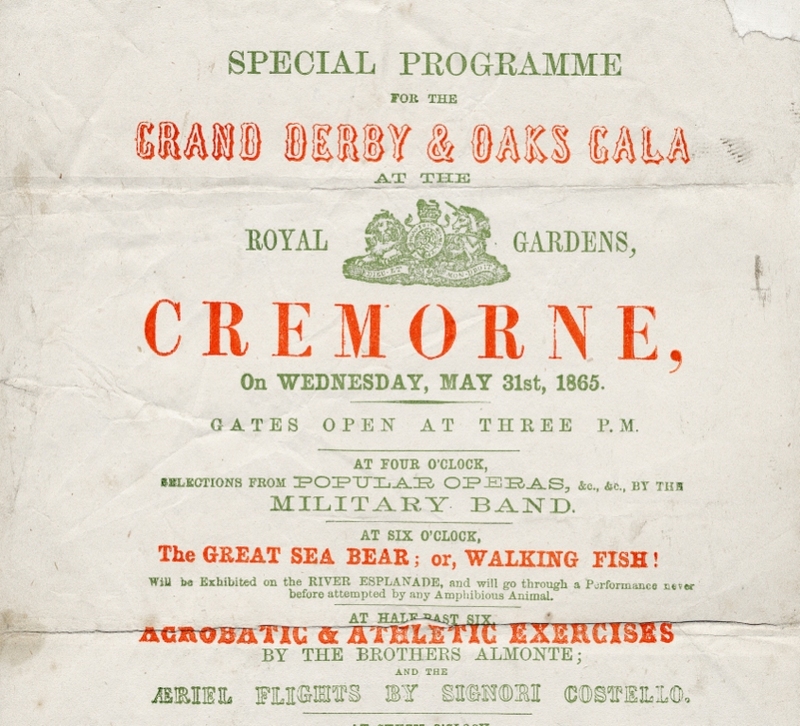 I am doing a PhD on race and exhibition in the nineteenth century and would like to find out more about exhibitions at Cremorne in the 1860s. Any help would be much appreciated. 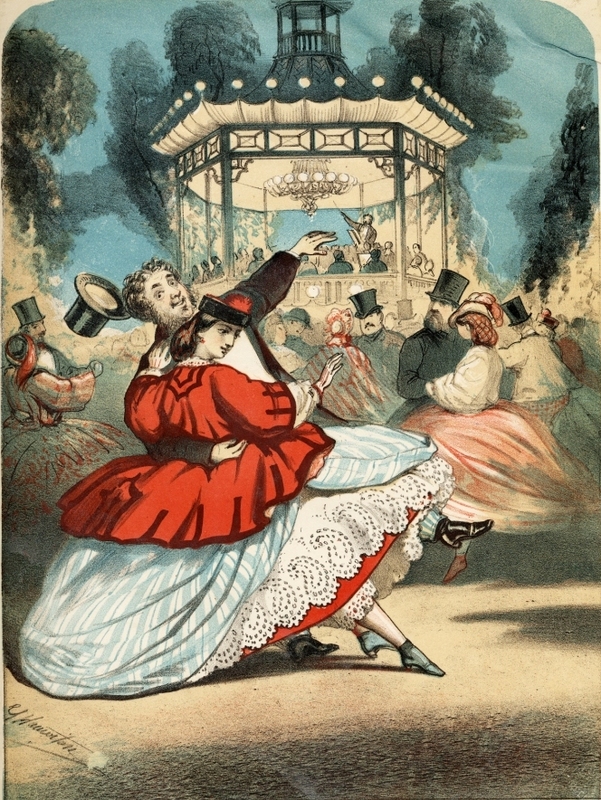 The Library has a set of scrapbooks devoted to Cremorne Gardens featurng handbills, posters, periodical articles and other ephemera – a wealth of material for researchers and one of our most popular items. Most of the material is still un-digitised so has to be seen in the flesh. This is great — thank you. This is my email address: jackdanielwebb@gmail.com. If you would like me to send on the results of any research (probably in the form of part of a thesis chapter), I’d be happy to do so.